Review by Dr. Robert Michael Davidson, MD: "This book should be required reading for all physicians, scientists, lawyers, law-makers, and the public at large"
"5 stars! Must-read caliber. Kudos to Dr. Cernic for writing this thorough, well-referenced review of a subject that affects everyone. Her book is a great gift and legacy for those who will live after us. Young parents-to-be would otherwise not be equipped to make an informed choice as to whether to vaccinate. I'm reminded of the late Dr. Mayer Eisenstein, MD JD MPH who once stated 'Educate before you vaccinate'. This book should be required reading for all physicians, scientists, lawyers, law-makers, and the public at large. 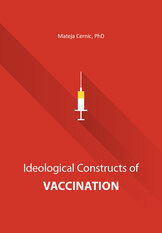 The ideological constructs upon which public health policy is made are propaganda-based, not science-based. Scientists are often silent for fear of retribution on discovering and disclosing the truth. Vaccine mandates are appalling deprivations of parental decision-making authority and God-given right to autonomy over our bodies. Those who oppose them should not be demonized. Physicians should abide by their Oath of Hippocrates to 'do no harm'. At very least, informed consent should be inviolate. Conscientious objection should trump man-made law. By way of disclosure, I was raised in a heavily-vaccinated military family. The harms suffered by my siblings are undeniable." Robert Michael Davidson, MD PhD, is an independent physician and medical researcher, who has published more than 30 papers in peer-reviewed journals. He completed his PhD in Pharmaceutical Chemistry at the age of 26 from UCSF, NSF postdoctoral fellowship at the National Bureau of Standards, Center for Analytical Chemistry, MD degree at St Louis University School of Medicine, Nuclear Medicine residency at Baylor College of Medicine, Houston, Texas, and Internal Medicine residency in Phoenix, Arizona.